Spectrophotometer instruments typically have a narrow wavelength resolution (approx. 2nm). However LEDs have a much broader wavelength range of 30-40 nm. We decided to try to use a bandpass filter to increase the resolution of the wavelength in the beerometer. We found a 430 nm bandpass filter from Cheshire Opticals, (part # 430.0 IF 10, 1/2" diameter). This filter has a bandwidth of 10 +/- 2 nm, which is a significant improvement over using the LED alone. In initial tests we mounted the filter into the beerometer infront of the LED and measured beer color (SRM) of 14 beers either with or without the bandpass filter. 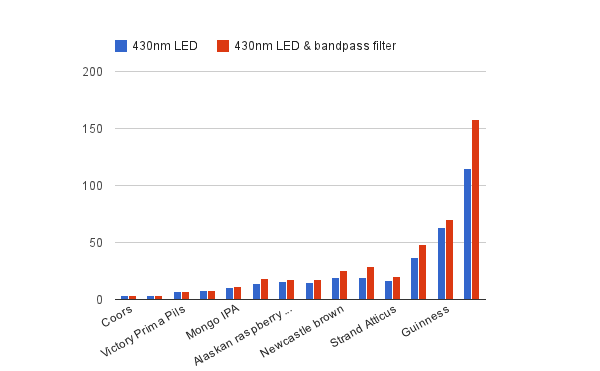 In all cases (except for the Victory Prima Pils), the value obtained for beer color increased when using the bandpass filter.